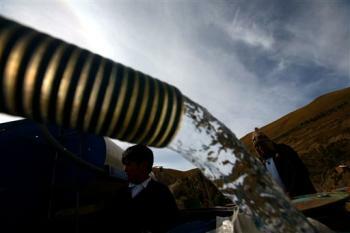 EL ALTO, Bolivia (AP) — Twice a day, Elena Quispe draws water from a spigot on the dusty fringe of this city, fills three grimy plastic containers and pushes them in a rickety wheelbarrow to the adobe home she shares with her husband and eight children. But the water supply is in peril. El Alto and its sister city of La Paz, the world's highest capital, depend on glaciers for at least a third of their water — more than any other urban sprawl. And those glaciers are rapidly melting because of global warming. Informed of the threat, Quispe, a 37-year-old Aymara Indian, shows alarm on her weathered face. "Where are we going to get water? Without water how can we live?" 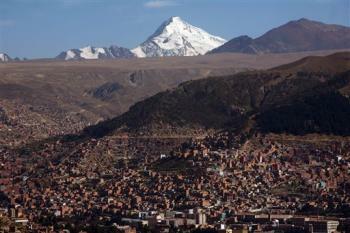 Scientists predict that all the glaciers in the tropical Andes will disappear by mid-century. The implications are dire not just for La Paz-El Alto but also for Quito, Ecuador, and Bogota, Colombia. More than 11 million people now live in the burgeoning cities, and El Alto alone is expanding at 5 percent a year. The melting of the glaciers threatens not just drinking water but also crops and the hydroelectric plants on which these cities rely. The affected countries will need hundreds of millions of dollars to build reservoirs, shore up leaky distribution networks and construct gas or oil-fired plants — money they simply don't have. "We're the ones who've contributed the least to global warming and we're getting hit with the biggest bill," laments Edson Ramirez, a Bolivian hydrologist who coordinates U.N., French- and Japanese-sponsored projects to quantify the damage exacted on fragile Andes ecosystems by richer nations that use more gas and create more pollution. Bolivia, South America's poorest country, is responsible for just 0.03 percent of the world's carbon dioxide emissions that scientists blame for global warming, says Ramirez. The United States, by contrast, contributes about one quarter. "It's not a question of cooperation. It's an obligation," he said. U.N. Secretary-General Ban Ki-moon is urging that a new global treaty on climate change provide funding to help poor countries adapt to its damaging effects. Ban made the recommendation recently when U.N. scientists released a report saying the 40 leading industrial countries produced 46 percent of global greenhouse gas emissions in 2004. 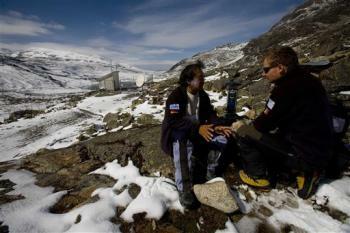 Starting in 2009, demand for water will outstrip supply in La Paz-El Alto, the government estimates. Without urgent, expensive projects — only now in initial planning stages — sustaining even the current population of 1.7 million will be impossible, said Oscar Paz, director of Bolivia's climate change program. 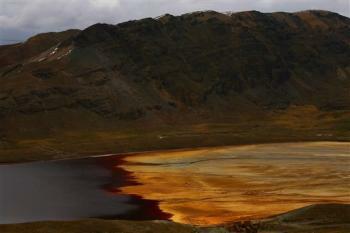 Similar fears are heard in Quito, which gets less than 10 percent of its water directly from the Antizana and Cotopaxi glaciers but much more from watersheds they feed. The Ecuadorean capital is expected to run short in 2015, even with a battery of projects already under way, including new reservoirs. So Quitenos plan to cut a $1.1 billion tunnel through the cordillera and get Amazon basin runoff, says Edgar Ayabaca, director of the city's so-called "Western Rivers" project. He said work on the tunnel needs to begin by 2010 if supply is to continue to meet demand. Bogota's fate is less clear. Bogota gets 70 percent of its water from alpine paramo, a fragile sponge of soil and vegetation often shrouded in clouds, which could dry up in higher temperatures. Average temperatures in El Alto and its surrounding high plains have risen by as much as 1.4 degrees Fahrenheit over the past 30 years, estimates Felix Trujillo, head meteorologist at Bolivia's National Meteorological and Hydrological Service. And the melting of Andean equatorial glaciers has accelerated threefold since 1980, studies of Bolivian, Ecuadorean and Peruvian glaciers show. These glaciers serve as natural shock absorbers for rain, accumulating it in the wet season and releasing it in the dry season. Their loss will lead to less rain because they help pry precipitation loose from moist air rising up from the Amazon basin, scientists say. "All these ecosystems are changing very quickly. In fact, every year they change at a faster pace, which has all of us very alarmed," said Walter Vergara, the World Bank's lead climatologist for Latin America. Signs of impending ecological confusion are already evident. Two years ago, Ramirez said, he discovered mosquitoes, flies and even butterflies for the first time at the base of one of the glaciers. Another first: malaria, a lowland disease, has been reported in El Alto, which is 2 1/2 miles above sea level and gets occasional dustings of snow. An hour away at Zongo glacier, a rocky shoulder that cradled the glacier in 1991 is now 250 feet above it. Down in El Alto, tens of thousands of the 850,000 residents lack running water. How many exactly depends who you ask. Public works director, Edwin Chuquimia, says it's more than half. The public water utility, EPSAS, says it's far less. The city's two mostly dried-up rivers, trickling rivulets in wide washes, are putrid open sewers. Homemade wells abound. 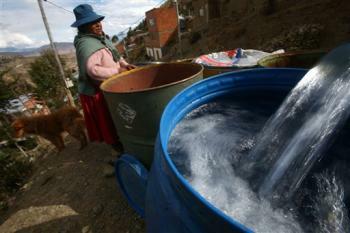 Forty percent of El Alto's water supply is lost to leaky pipes and theft, about the same rate as in Quito and Bogota. The golden rule of the leftist Morales' government: No one profits from water sales. But critics argue that such a philosophy doesn't provide enough cash for badly needed investments. Infrastructure projects totaling $60 million can guarantee El Alto-La Paz enough water for the next decade or so, said EPSAS director Victor Rico, but the utility has no more than $1.5 million a year to invest. Rico has secured a $5.5 million Venezuelan loan and said he has promises of a $5 million grant from the European Union, the possibility of $8 million in mixed Canadian financing, and possibly some Japanese and InterAmerican Development Bank money. A land use dispute in El Alto has already killed a $2 million Swiss-funded initiative in March that would have built two waste water treatment plants in El Alto, said Thomas Hentschel, the project manager. "It really hurt me, there was such need," he said. "Everything there was left up in the air." 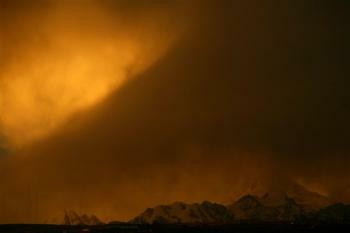 AP writers Dan Keane in El Alto, Bolivia, and Gonzalo Solano in Quito, Ecuador, contributed to this report.